CLAREMORE (June 1, 2017) – Teachers in Claremore are preserving a dying art – with more than 140 characters – and hoping their efforts will build a bridge to summer reading. History teacher Jan McClaren established the annual tradition at Claremore after participating in a similar event at Woodward Public Schools more than 20 years ago. “The idea of storytelling is passing history down for generations, and that art is dying because we’re using gifs instead of long stories,” said McClaren, who pointed to texting and tweeting as some of the abbreviated forms of communication that dominate her students’ lives. Jill Andrews emphasizes the cultural and literary importance of storytelling early in the year in her senior English classes. She connects Beowulf to the Anglo-Saxon storytelling tradition, which is mirrored throughout many other cultures, and tries to make it relevant to her teenage students. Andrews said teachers want the students to develop a lifelong love for stories and hope the students’ experiences at the festival will spark more interest in the Will Rogers Library’s Summer Reading program, which kicked off June 1. For the festival, Andrews encourages her seniors to choose stories that have cultural, historical or literary significance and a moral or lesson. The students are not allowed to read their stories from books. They memorize them and practice delivery in class in preparation for the festival. At the lake, about 300 second-graders in small groups rotate through several of the dozens of storytelling stations. At first, Andrews’ students are hesitant about performing for the children but warm up to the experience throughout the day of the festival. “By the third or fourth time, they’re embellishing their stories a little bit more, so they’re really learning how to communicate orally, which our kids don’t do so much with phones and social media," she said. "They’re not just typing something out, they’re standing there face to face, interacting with the kids and their peers. They learn to ad-lib and change things around if it doesn’t work the first time." Brenda Beymer-Chapman, Oklahoma State Department of Education (OSDE) director of social studies and personal financial literacy, said storytelling is the best way to teach history. “Storytelling is the oldest form of education. It was how societies passed on the values of their culture. Storytelling is something humans relate to and do every day. A person can always relate their experiences with a story,” Beymer-Chapman said. The benefits of the Storytelling Festival go both ways, teachers say. Interacting with the big kids is a cherished experience for Claremore’s second-graders because it makes stories come alive and reinforces critical skills they are learning in their classrooms. Sharole Beasley, who teaches second grade at Catalayah Elementary, said high school athletes and students from nearby Rogers State University are instant role models for her students when they visit her classroom. Kurt Bernhardt, executive director of education technology for the OSDE, said emerging digital storytelling tools are helping to counter the disadvantages of oversimplified digital media blasts. Tellagami is an app in which kids pick a background, record stories through a microphone and create animated versions of themselves that sync with the audio. ChatterPix is a similar app that allows pictures to “talk” using a student’s recorded voice. Lauren Collings, library media specialist at Central Elementary in Putnam City Schools, said her students use these apps to retell stories they have read together as well as in correlation with writing and researching. “As a result of these apps, the creativity of our students has blossomed, and I have noticed an increased motivation for writing and communication. Next year, we plan on using Tellagami in our maker space to explain various inventions that the students are working on,” Collings said. June Gerred, director of instructional technology at Glenpool Public Schools, uses ChatterPix for fluency, memorization and the retelling of stories with third- and fourth-graders. “The students like the entertainment the app offers, and it allows verbal expression without the fear of being on the spot. It lets the animation be ‘their voice,’” Gerred said. Gerred also uses My Story Book Creator, an app that allows children’s works to be published to Apple’s iBooks store. Young children can draw or use the sticker tools to create their storylines. She challenges older children to retell complicated stories by adding their own text. Students in Kay Dalton’s technology classes at Justus-Tiawah Public School in Claremore publish digital books using the websites Storybird and Storyjumper. They have retold Aesop’s Fables via stop-motion with clay characters, homemade backdrops and iPads, and fairy tales using shadow puppets. They also use the website Scratch to create animated comics through coding. Laurel Reynolds, adorned in Native American beads, stood on the grass under the shade of a tree with the lake at her back. The Claremore High senior told a Cherokee story of the sun’s ability to heal a marriage with a gift of ripe strawberries. The strawberries magically grew at the feet of a woman fleeing her husband’s harsh words. When she stops for the strawberries, it allows him to catch up and make amends. The story concludes that whenever the Cherokee eat strawberries, they are reminded to be kind to one another. Reynolds, who is active in drama, said she loved acting out the story for the children and sharing her heritage with them. She said the story has been passed down through her family. Cooper Price, who is planning to study to be an accountant after graduation, chose a more modern story: “If You Give a Pig a Pancake,” a children’s book by Laura Numeroff and Felicia Bond. He brought a toy pig nose as a prop and let second-grader Jaxon Ripley wear it as a costume to act out the story as he told it. His tale was a hit because he was able to engage the children. “They liked it, I think. It went a little better than I thought it would, to be honest. Letting him be the pig, I think he liked doing that. They all liked that,” Price said. Animal stories were popular at the festival. Braxon Chastain, a second-grader at Claremont Elementary, got to act out a story about how elephants got their long trunks. He said he would be retelling it to his friends back at school. “The alligators stretched out their noses. On a scale of 1 to 10, it was a 10,” he said. 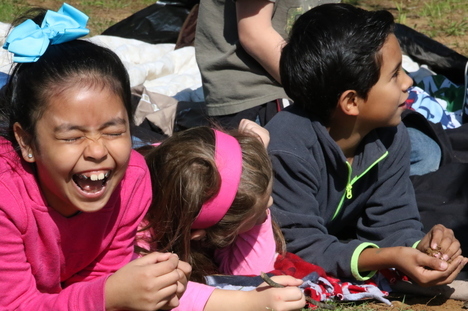 Ruby Jaimes-Bravo, Ivy Herrington and Martin Perez, second-graders at Claremont Elementary School, laugh as they watch Claremore High School students act out a story at the annual Storytelling Festival. Claremore’s annual Storytelling Festival celebrated its 17th year this spring. 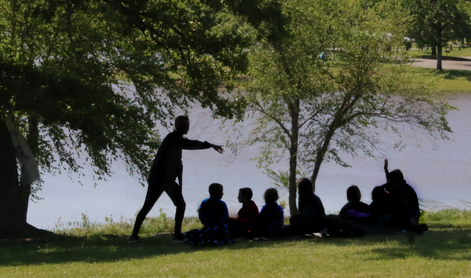 During the festival, about 300 second-graders gather at Claremore Lake to hear the high school’s seniors share fables and folk tales. Teachers say the children learn to listen and the teens learn public speaking and communication skills. 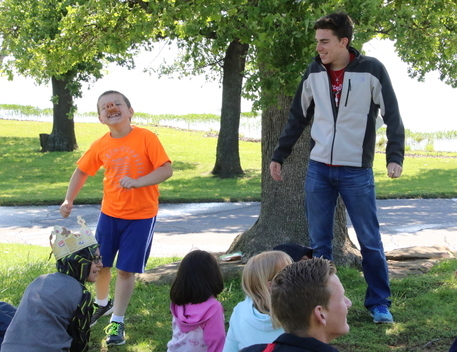 Jaxon Ripley, a second-grader at Catalayah Elementary School, portrays the lead character in the story “If You Give a Pig a Pancake,” the classic children’s story as retold by Claremore High School senior Cooper Price (right). 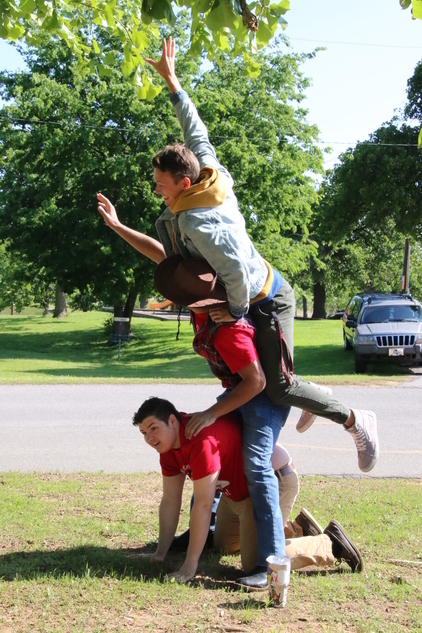 Austin Henry and Elving Martinez give a lift to Jackson Long as they act out a folk tale explaining why giraffes are so tall at the annual Storytelling Festival in Claremore.